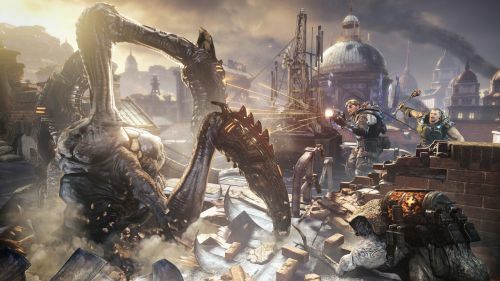 Gears of War: Judgment features all the co-op options from Gears of War 3. Same menus, same options, same player counts. If you could do it in Gears 3, you can do it in Gears: Judgment -as long as you don't want to play Horde mode. How many players can play Gears of War: Judgment locally (couch co-op)? How many players can play Gears of War: Judgment via system link or LAN? How many players can play Gears of War: Judgment online? Is a Gold Membership required for the second player in combo co-op on the 360? What direction is the screen split in couch co-op for Gears of War: Judgment? How do you begin a co-op session in Gears of War: Judgment? How does save game progress work for co-op play in Gears of War: Judgment? Can I join a game if the host is further along than me in Gears of War: Judgment? What does the Gears of War: Judgment season pass get you? 2-5 players for co-op. 2-10 players for MP. 4 co-op players can play through the campaign online. 5 co-op players can play in Survival mode or Bot-filled MP matches. 10 players can play in MP matches. 2 players can play online on one 360. Both must have an Xbox 360 Gold membership. From the Main Menu players can choose party connection options: Joinable Public, Joinable Friends, Invite-Only, System Link, and Local. Players can then choose the game type and player options. Players can invite friend, party members, or join sessions in progress. Each player\'s story progress, XP, and unlocks are saved to their own profile. The VIP Season Pass (1600MSP or $20) serves as your pre-order for two Game Add-on Packs (6 total multiplayer maps and 2 new modes) and provides instant access to 9 exclusive skins and special VIP-only playlists which grant double XP. And you’ll get early access to upcoming multiplayer maps. Page created in 0.3363 seconds.